FutureTouch Technology - Portfolio Details For HitDisc, Inc.
Based on patented technology, HipDisc contracted with FutureTouch to create a revolutionary new method of delivering digital products such as music, computer games and audio books to consumers at high traffic public locations such as malls, airports, hotels, game arcades, theme parks, etc. 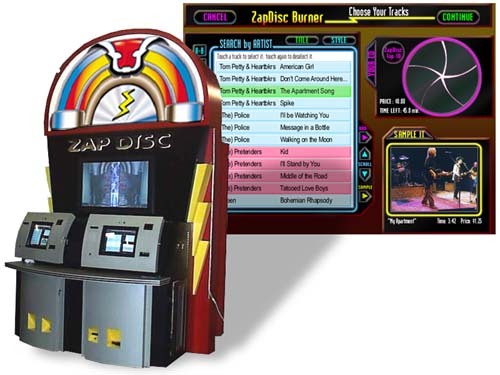 The completely self-contained kiosk system allows consumers to easily select up to 10 of their favorite titles, and pay by cash or credit card, and receive the completed customized CD while they wait. The kiosk also dispenses a jewel case and a printed track list on a sticker that is affixed to the jewel case. A 42-inch plasma display is integrated into the kiosk cabinet design to allow advertisements such as music videos, movie trailers, and brand name product commercials to be displayed.